The kids have been sleeping with us in bed since they were born and I assume it is no biggie for Merl. But on times when they would fall off the bed at 2am screaming bloody murder, he’d get mad and say, “Gahd! What’s the point of buying a crib!” By one year old we will should get Maxine her own bed, I’d say softly, half-meant. It never happened. She’s three and a half now. Before I started to have kids one of the rules I laid down was, No Children in Bed. I wanted the Western way, babies in their own nursery, with only those walkie-talkie thingies to monitor even if that sounded taboo in this country. But since we started in a bachelor pad, there’s just not enough space for an extra room. So the crib was stationed beside the master’s bed. It’s 5am, no 5:30. It could even be 7am… Max has summer school at 8! I’m bad with mornings, I don’t test well in blue light. It’s quiet, probably it’s 6am. Moms have this thing with getting the right time based on situations. I can feel the rise and fall of Maia’s chest. I would listen intently to make sure all of the living things in the bed are breathing. Just to be alive is the best gift ever. I hide, creating a cocoon of pillows and duvet waiting for my wings to appear, waiting for the kids to wake up that is. My body aches, my arms numb in this cramped bed and yet my nights are dreamless, perfect, waking to answer a child’s demand, “Hug me, Mama,” and a few moments later, the baby who is sleep-drunk as I nurse right away even at a slightest whimper. It is drowsy but blissful, cozy and life-affirming. I just couldn’t do it any other way. The husband tells me he needed more room. It’s a california king size bed. Sorry we kinda knocked the King out of it. How can I tell him that the kids will sleep with me ‘til they are 16? He’d freak out. I can’t even imagine sleeping without them. Of inhaling emptiness where their breaths used to be. Yup, there are entire nights without us touching each other and you say we need to have our little hideaway where we can remember that we’re a married couple in love and not just mom and a dad. You do have to make extra efforts to nurture your couple life and intimacy, though. But who says you need to do it in the bed? Before I had kids I was so sure I didn’t want them sleeping with us. But becoming a mother taught me so much about the unpredictability of parenting. Let me just tweak this rule a little bit… you know. I know that these moments with the kids will one day be incredibly rare and incredibly precious, appraised beyond the value, and after a few years, extinct. So at this point I enjoy the jabs to my side like KungFu Panda kicks, when I lose hair from accidental tugging, bodies intertwining like ribbons, the spooning, the ‘mom sandwhich’. These won’t last forever and one day I’d surely miss it like decadent cake to a diabetic. 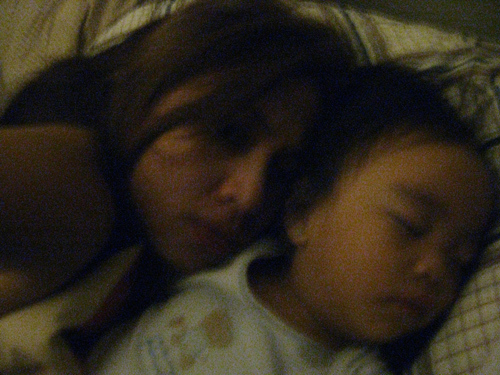 Waking up beside the kids is like waking up with the sweetest sunshine. When the little whispers, giggles, eskimo kisses and nonsensical secrets start. I don’t really know when I’d get the beds, or maybe not at all. Maybe when we transfer to the new house, Max insists for a fairy princess pink and purple room. For the meantime wild horses couldn’t drag me away. We’ll play it by ear.